Bikers will laugh. Non-bikers will shake their heads in disbelief. Drivers won’t really understand what they are seeing and cyclists require an extra wide birth for fear of being accidentally sucked under the front axle. 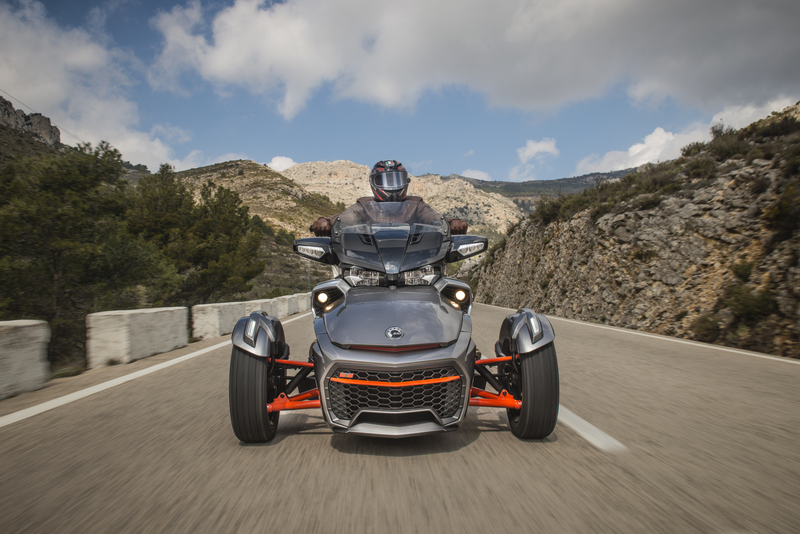 Life with a Can-Am Spyder isn’t exactly straightforward, but then you don’t buy a £20,000, three-wheeled motorcycle/car/trike hybrid if all marbles are firmly intact. The Spyder has always been the rich kid’s plaything and, even though its near-bulletproof 1,330cc Rotax engine delivers the thrills, the slightly odd two-wheels-at-the-front-and-one-at-the-rear layout means it shuns the traffic-busting practicality offered to those purchasing a motorcycle, yet leaves riders equally as exposed to the elements. But sometimes a vehicle doesn’t have to make sense. Sometimes it tugs you by the heartstrings, lures you into a dealership and makes you part with your hard earned cash for no other reason than lust. Squint hard enough and you can see how the latest Spyder F3T does this. The engine, which is typically found in BRP’s range of skidoos and snowmobiles, develops a heady 112hp and 130Nm of torque at 7,250rpm. The riding position is aggressive yet surprisingly comfortable and the funny three-wheeled set-up actually does make it feel a lot more stable on the road. Power is sent to the chunky rear wheel, while advanced traction control and ABS is on hand to prevent the front wheels from understeering and washing out on tighter bends. Don’t be fooled, this is no lithe superbike and it can be a bit of a bruiser to thread through curvier sections of road. But pin the throttle, feather the foot brake and it will do pretty epic burnouts, while offering a large enough tank and plentiful stowage for long journeys. 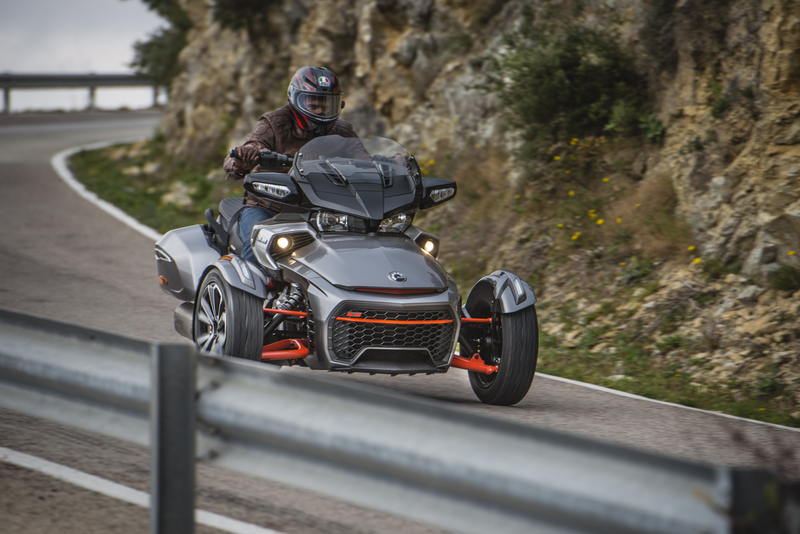 With the Spyder F3T we’ve headed to Alicante, one of the most famous and showy port cities on Spain’s south-eastern Costa Blanca. It may be nearly an hour away from the bright lights of Alicante but this little boutique spot is well worth the journey. The views out over the Costa Blanca are phenomenal and the charming rustic architecture looks fantastic when lit up in the evenings. The exterior may be period but the rooms are ultra-modern, with giant four-poster beds, flat-screen TVs, high-speed internet and tasteful decor. The hotel also offers plenty of local excursions and guided hiking opportunities for adventurous types but the surrounding roads are enough to have speed junkies entertained for days. The seafood is delicious, the weather is predictably sunny and there are some testing roads that wind their way up to the peaks of Serra del Maigmó and Serra del Sit. Our trip begins in a pretty generic Costa Blanca resort, as budget constraints prohibit overt extravagance this time, but there are some phenomenal boutique offerings available to those who are willing to part with more serious cash sums (see our recommendations for inspiration). 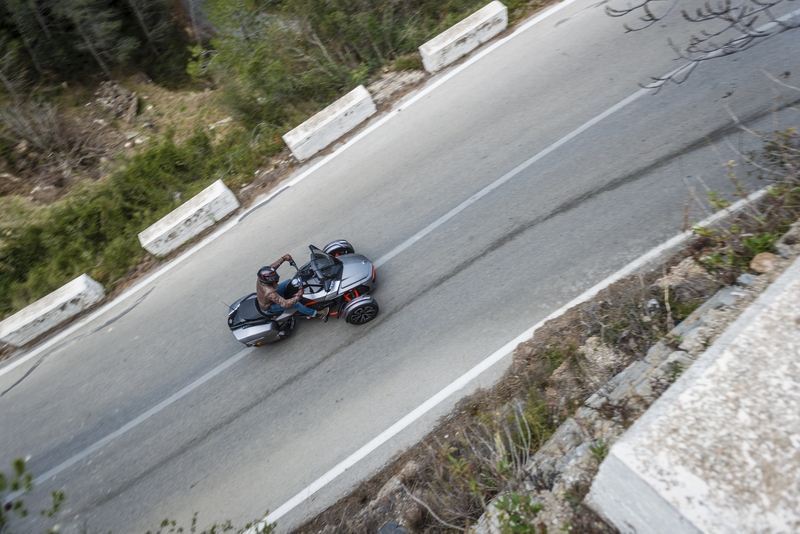 The route actually takes us inland from Alicante, up towards Elda and the rugged scrubland of the Parc Natural de la Serra de Mariola, but not before we get acquainted with the Spyder’s controls. It’s tricky to find a pair of motorcycle boots that look good both on the bike and in the bar but TXC has got you covered. The Hero range is not only waterproof but also styled to look like a Red Wing/Dr Martens hybrid. Better still, they feature toe, heel and ankle reinforcements for added protection, a full grain leather upper and a waterproof lining should the Heavens open. The vintage brown colouring also compliments a pair of jeans and a well-worn leather jacket, which will go some way towards making the Can Am Spyder look slightly more acceptable in motorcycling circles. Throttle is taken care of via a traditional twist grip but there are thumb shifters to deal with the the semi-automatic gearbox and a footbrake that provides the stopping power, as opposed to the traditional handlebar-mounted front brake and foot-activated rear brakes found on a motorcycle. It’s also a heavy brute, so there’s a reverse gear to aid slipping in and out of parking spots. All in all, it takes around ten minutes to get used to the thing, perhaps longer if you’ve never graced a motorcycle. 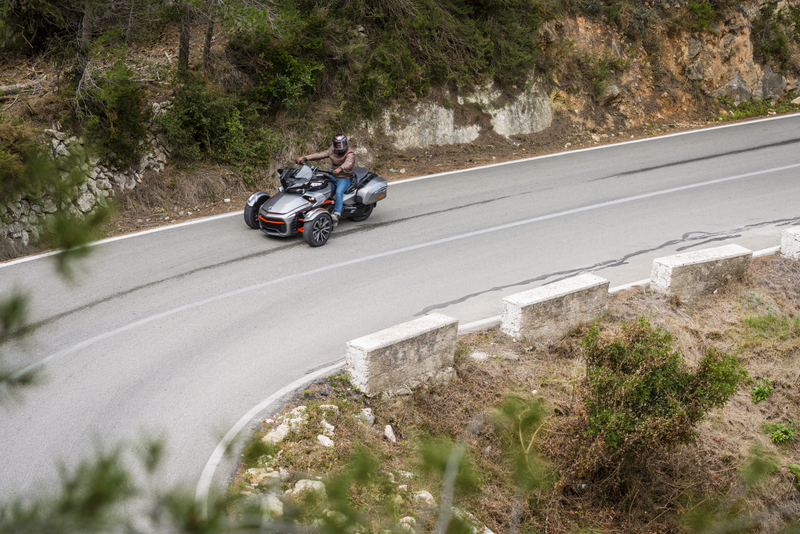 We speed out of town, using all of the available torque to propel the Spyder along the immaculate Tarmac found in this part of Spain. Twist the throttle and there’s a slight delay as the traction control does its bit to stop that wide rear tyre from spinning up but the three-wheeled machine is soon tickling very illegal speeds. There’s very little wind buffeting to bother our AGV helmet on the open highways thanks to the aggressive styling of the front end, which not only looks cool but sees air pushed over the nose and above a small screen in front of the rider/driver. It is not long before we turn off the Autovía de Alicante and take the more challenging CV-837, which cuts through arid landscape and offers some serious switchbacks on which to push the Spyder a bit more. Unfortunately, this thing suffers from a lot of understeer and no matter how much you attempt to hang your arse off the deeply padded seat, the machine refuses to swing its tail out and efficiently (or ludicrously) take a corner. 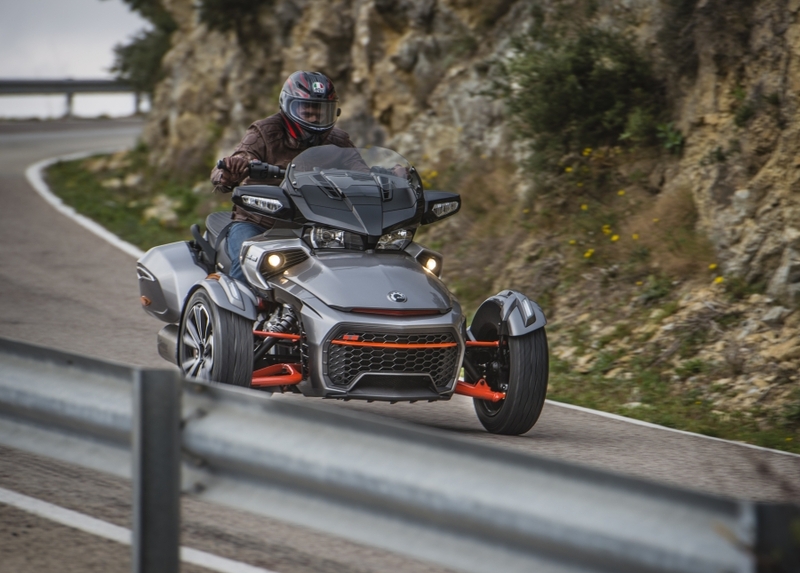 In a move that will ensure Spyder owners don’t explode in a ball of fire at the first bend, the ABS and traction control kick in at the faintest hint of the front wheels washing out, scrubbing off any speed and spoiling the fun. Pronto. We found that a light feathering of the footbrake was enough to fool the on-board electronics into the occasional rear-wheel lock-up, allowing the tail to snap around, but it’s all a bit messy. The national park around Los Molinos doesn’t fail to disappoint with its vistas though and it’s not long before we park up the Spyder in a gravel lay-by and survey Alicante from above. It’s a good chance to fiddle around with the machine’s infotainment system, which includes a sat-nav and a built-in radio and MP3 player with external speakers. If you needed an excuse to look even more like a complete tool, try blaring Euro Pop out of the system as you roll through a sleepy Spanish town. 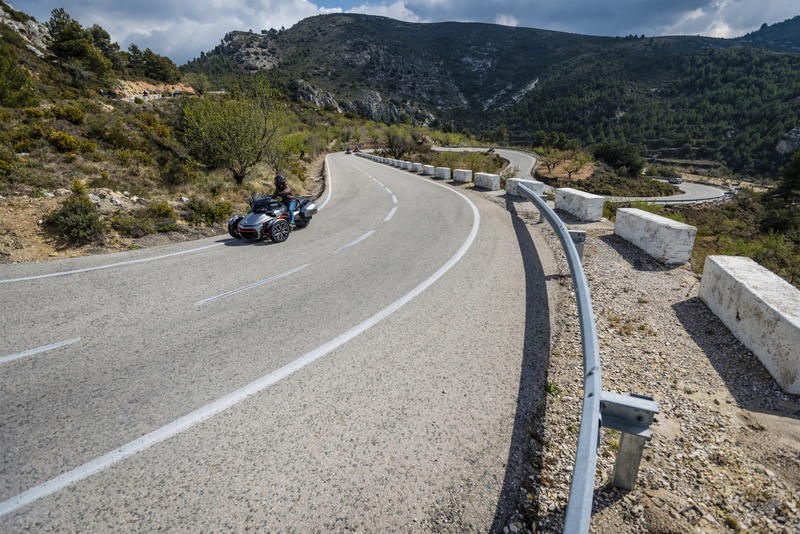 We decide to point the machine towards the CV-70 and CV-755, more brilliantly challenging stretches of road that host a fantastic restaurant in the shape of El Riu (itself located next to a historic motorcycle museum). 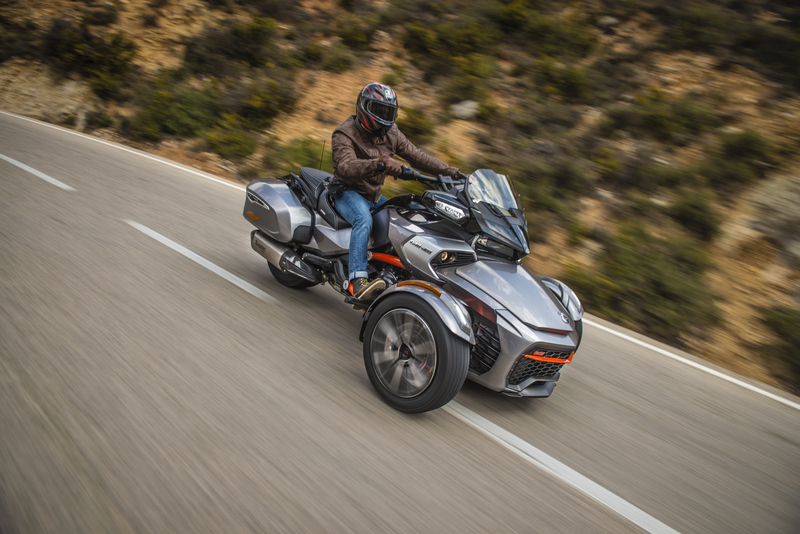 It may have been designed for epic US Highway road trips but, when cruising through rural Spain, the Can Am Spyder does prove a hit. After a late lunch featuring many meatballs, cured hams and delicious local olives, we follow the small ‘CV’ roads back towards another generic seafront resort in Altea. The sun is beginning to set as we roll into town, the dusk light bouncing off the jet-black paint job of the Spyder. Local residents are out on the streets for the evening, playing boules and sharing a drink or two. The clearly visible spaceframe of the F3T cuts a menacing presence on the road and we attract a few glances and the odd appreciative nod from those enjoying the last of the evening’s light. 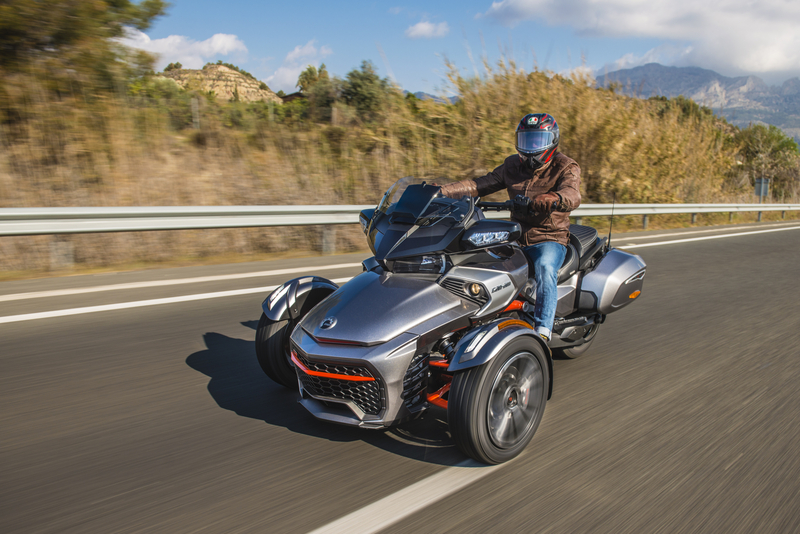 Parked up in front of the rustic fishing boats, with the tiny waves of the Balearic Sea lapping against the shore, the Can-Am Spyder F3T feels strangely at home. It may not have made sense at the beginning of this road trip but strangely it does now. There’s not a whiff of backache thanks to the adjustable riding position and suspension settings, our belongings aren’t creased or broken due to the ample storage space and we’re left with a little buzz that only certain vehicles deliver. Yes, it’s horrendously expensive. Yes, it would be a pain in the bum to ride in the dismal weather of England but here, on the sun-soaked roads of southern Spain, it feels like a wise move. The rustic building looks like a farmhouse from the outside but the staff serve up some of the tastiest meat in the region, all cooked over a giant wood and charcoal fire. Salivate as whole legs of pork, an array of sausages and beef steaks sizzle on the huge open grill, snack on homemade breads and pop a few olives in your mouth for good measure. After the post-dinner coffee, head next door and take a look at a stunning collection of vintage motorcycles. The museum costs around €10 and it’s not the largest collection in the world but the owner will happily give you a personal guided tour.